Question: I know I have to stop using my female pattern hair loss treatment medication and can’t take my Hair Vitalics whilst I’m pregnant but can I continue to use my HairMax LaserComb? Answer: Hi, Amita. Firstly, congratulations on your pregnancy! We hope everything is going smoothly for you. You are absolutely correct that women cannot use genetic hair loss treatment eg. applications of high strength minoxidil, during pregnancy; this is also the case whilst they are breastfeeding or expressing. The same is true of Hair Vitalics for Women; these food supplements should not be taken until after you have given birth and, if you are breastfeeding, the course should not be resumed until you have finished nursing. At Belgravia we advise our female patients that no hair loss treatments or hair growth supporting products – including low level laser therapy devices such as the LaserComb – should be used during pregnancy or whilst breastfeeding, as a precaution. Furthermore, if you have a male partner with whom you are sexually active during your pregnancy, and who is also using hair loss treatment, he too should stop taking finasteride 1mg during this time (in fact, he should stop taking this DHT-blocker one week before you start trying to conceive). He is, however, fine to continue using minoxidil throughout this period. If preferable, as long as you do not handle any finasteride tablets, it is also possible for him to continue to take his finasteride 1mg as normal as long as he uses a barrier contraceptive method (condoms) whilst you are pregnant and breastfeeding. 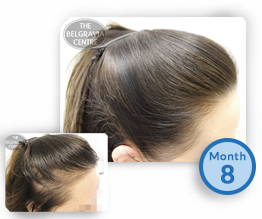 After you have had your baby, if you would like to restart your Female Pattern Hair Loss treatment course, the best thing to do is to consult your dedicated specialist who will be able to assess you and check whether any tweaks to your original programme are necessary before you start again after you have finished breastfeeding, where applicable. For instance, many women experience Post Partum Alopecia – excessive shedding and thinning hair after having a baby – which is an entirely normal postnatal phenomenon. The hair will generally return to its pre-pregnancy state within approximately 12 months, however, as you have an existing hair loss condition which may be exacerbated by this, or the stress of childbirth and coping with a new baby, it is certainly recommended that you are re-assessed before resuming treatment. That way, your specialist can ensure you are on the most appropriate, personalised course, with optimum hair loss solutions based on your current situation. 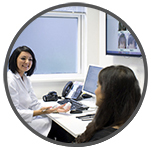 If you would like to discuss any of this information further, or need any additional support from your Treatment Advisor, do just drop them an email or call the clinic on 020 7730 6666 at your convenience and they’ll be happy to assist you. Can You Have PRP Hair Loss Treatment Whilst Pregnant?